Reprinted from: Hortus Plant Propagation from Cuttings, a guide to using plant rooting hormones by foliar and basal methods. By: Joel Kroin, President, Hortus USA Corp.
Plant researchers had long known that plants produce chemicals that cause to divide and become roots. In 1934 Thimann and Went identified IAA (Indole-3-acetic acid), a rooting hormone, now called auxin. IAA is produced in the leaves of plants and is found in other plant parts. It is unstable and degrades rapidly in the presence of light and heat. More stable than IAA, the bio-simulators IBA (Indole-3-butyric acid) and (Naphthalene acetic acid) are the commercially used rooting compounds. IBA and NAA are stable and remain active for use by plants over a long time. IBA and NAA are known to induce plant cells to form adventitious roots. Of the three, IBA is the most useful auxin to propagate plants from cuttings. cell to cell in various parts of the plant, vascular cambium, pro-cambial strands and perhaps the epidermal cells. • tropic responses (bending) that is sometimes noticed on tender leaves when using foliar applied auxins. • In some cases, the effect of excess auxin is to inhibit growth (1). 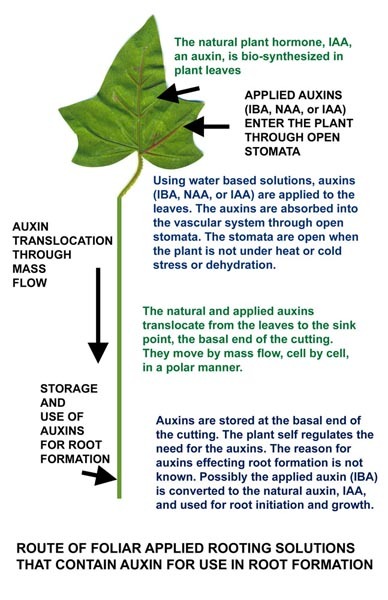 To induce root formation, early investigators and growers until today have applied the auxins to the basal end of the cuttings. Dry compounds: Dry powder auxin compounds and solutions containing auxin were found to be useful. The auxins are blended with a carrier, usually talcum powder. Early users also mixed the auxins with powdered charcoal. Liquid compounds: Common forms of the auxins are soluble in active solvents like alcohol. The solutions made with the auxins were first used in low concentration basal soaks. Using rooting solutions at low concentrations, early literature describes the basal long soak method. The basal end of the cuttings are immersed in the solution, at a few ppm auxin, for a few hours to several days. The method is successful on many kinds of plants. It has been used on soft herbaceous to woody ornamental plants. Later, the basal quick dip method was developed. The basal end of the cuttings are immersed in the auxin solution for a few seconds. The method uses auxin rates much higher than the basal long soak method. Alcohol as the solvent is need to make solutions of the auxins. Early users found alcohol to cause phytoxicity to plant cells and case mortality to the cuttings. The water soluble salts of the auxins was not as well adopted. Therefore, the auxin solutions were used at low rates to allow use of low concentrations of the alcohol. leaf contribution to root formation. In 1946, van Overbeek observed that the action of the natural plant rooting hormone in the leaves of plants is essential for plant cuttings to form roots at the basal ends. The rooting hormones are transported from the leaves to the basal end. The basal end is a wound sink point of cuttings. Both IBA and NAA have been found useful as single component applied auxins Of the three auxins, IBA has been most the most used for foliar application. Eigenraam at Rhizopon found that the combination of IAA and NAA, and IBA and NAA are effective on pot rose propagation. As the natural fluid in the plant structure, water was selected by Rhizopon as the carrier for the plant rooting hormones for foliar applications of rooting hormone solutions. While alcohol is another solvent for rooting hormone compounds it was not selected. Alcohol can be phyto-toxic to plant tissues since it will dehydrate plant cells and cause the mortality; this phenomenon is commonly called ‘alcohol burns’. Two physiologically distinct, and spatially separated pathways, function to transport auxins over long distances through plants. • the secondary body through the phellogen, and the cambium. 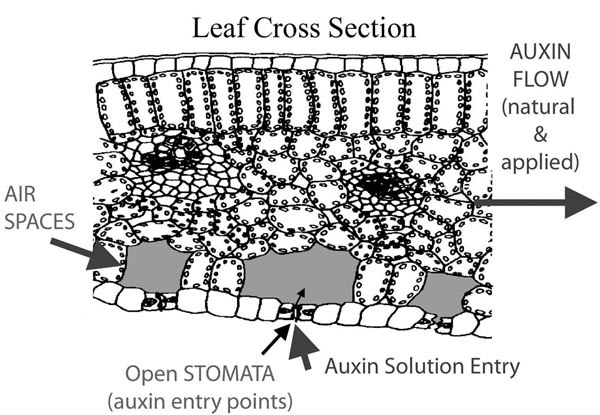 Auxin solutions enter the stomata rapidly and are captured in the leaves and stems of the plants. The solutions are able to freely move down the leaves and stems toward the rooting site sink point. The speed of travel of the solution is influenced by plant variety, hydration and irradiance. Once the induced solution is in the plant system there is no critical amount of time for the auxin to translocate to the rooting site. After auxins in the plant system operations, such as misting of leaves, can resume. Water based rooting solutions, with auxin compounds such as IBA, can be applied to the leaves of plant cuttings. The solution enters the vascular system of the plant through open stomata. 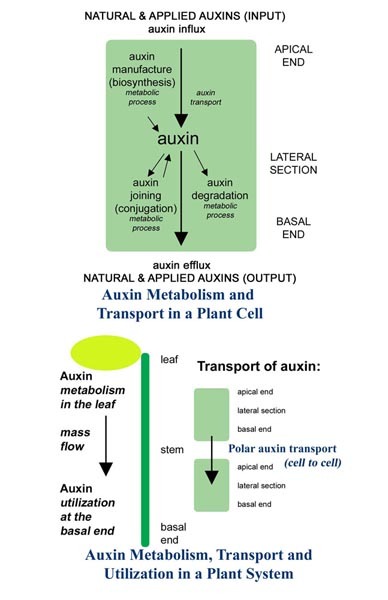 Auxins translocate polarly through the stems to the basal end of the cutting. 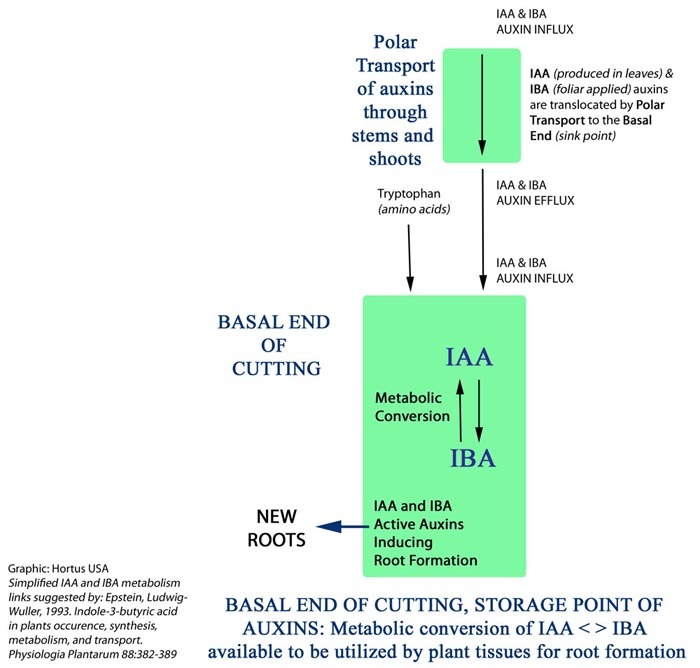 IBA can be converted by the plant to IAA, by slow bio-transformation, and utilized by the cutting to make new roots at the basal end. 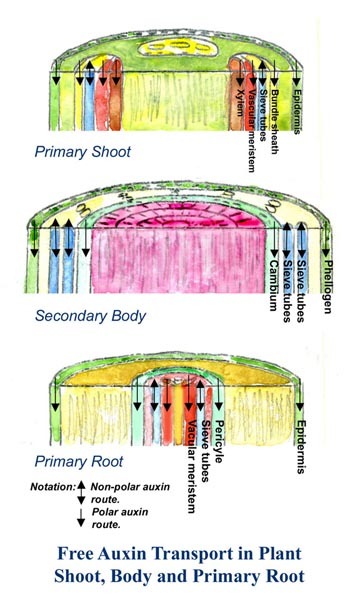 process of root formation in cuttings. Am J of Bot. 33:100-107. Biosynthesis, Signal Transduction, Action!, Springer, 2004, pg. 474. Biosynthesis, Signal Transduction, Action! Dordrecht NL: Kluwer Ach. Publ., pg. 438-9. Biosynthesis, Signal Transduction, Action!, Dordrecht NL: Kluwer Ach. Publ., pg. 477.
metabolism and transport. Physiolgia Plantarum. 1993. Volume 88 issue 2, pgs 383-389.
cuttings of grapevine and olive. Plant and Cell Physiology.1984.Vol 25,No 5, pgs 697-703. Orchard. Chicago: Univ of Chicago Press. pg 34.